Stories. Every family has them. The kind that are told over and over again until they become legend. Until you’re no longer sure whether you actually remember the event, or just its repeated retelling. My family has plenty. The time my sister got her knee stuck in the railing at Alton Towers. The episode of carsickness where we discovered that Quality Street tins are not, in fact, watertight. The night my dad forgot to pick me up from Girls Brigade. Or my Grandad’s runaway milkfloat. Which, incidentally, is easily done. Who needs handbrakes anyway? We have lots of stories. Running jokes. Sweet little anecdotes, without an ounce of malice in them. But there’s one that has always bothered me. That gets retold on a regular basis, and confuses me every time. Whilst stoking my already well fueled fires of utter-misunderstoodness. It happened one night when I was four or five. And particularly strong-willed. My parents had, evidently, reached the limits of their patience, and my dad decided it was time to instil a little obedience into me. Family legend has it that he put up a set of plastic skittles in my room and sat on the floor, demanding that I bring him the blue one. And then the red one. And then the green one. Over and over again. Until I did as I was told. Whilst I begged him to let me go to sleep, and Mum cried on the stairs. I’ve never understood it. Why my Mum stood by and let it happen. Why my parents were so determined to crush my blossoming, charming independent spirit. Why I didn’t call Childline, when I had their number memorised for just such emergencies. I’ve never understood it. Until tonight. When, for the fourth day this week, Elvie has refused to listen to a single word we say. Pushed every button we possess, and introduced a few new ones for good measure. Chatted back, hit, screamed and generally behaved like the spoilt brat we have tried our utmost to prevent her becoming. We can hold it together. Just about. When we’re both around. Until it gets to bedtime. Bath done, pyjamas on, story read, prayers recited, lights off. And then, just as you reach the bottom of the stairs, there’s a little click. And her light’s back on. Like clockwork. And so begins a battle. Which continues until about 10pm. Based on the evidence so far. There’s always the possibility she’ll make it to midnight eventually. There is absolutely no reasoning with her. None at all. All you’ll get for your efforts is a hands-on-hips, smart-arse retort. Or the promise that she’ll never listen to anything you say ever again unless you let her stay up forever. All delivered at a volume that threatens to wake the rest of the street, let alone her brother. We’ve tried softball. We’ve tried hardball. We’ve tried threatening to lock her in her room and tie her to her bed. And yes, I know you’re not supposed to give children idle threats, but I can promise you that in the heat of the moment, there was nothing idle about it. We are, for want of a better word, buggered. 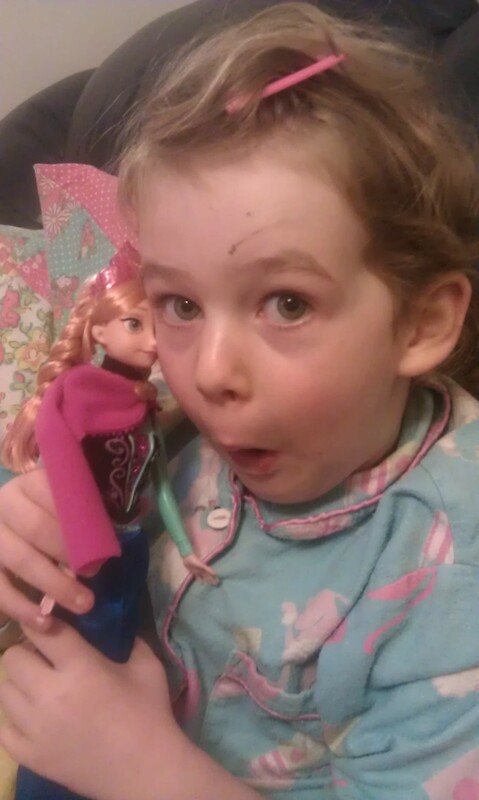 Outsmarted by a four year old with blonde curls, a will of iron and pyjamas depicting a woodland creatures sleepover. I have absolutely no answers. Neither does the internet. The current plan revolves around telling her that, as long as she’s quiet and stays in her room, she can stay awake as long as she likes. In the desperate hope that, with the element of challenge removed, she’ll just give up and go to bed. That has been the plan for just over an hour. She’s still reading. Light on. As I said, I have absolutely no answers. I do however, have a new and profound level of solidarity with my parents. As well as the surreal experience of watching as-near-as-I’ll-ever-get-to myself as a small child. And a sudden, burning desire for a set of plastic skittles.